Washington D.C. — The Securities and Exchange Commission today announced charges against nine defendants for participating in a previously disclosed scheme to hack into the SEC’s EDGAR system and extract nonpublic information to use for illegal trading. 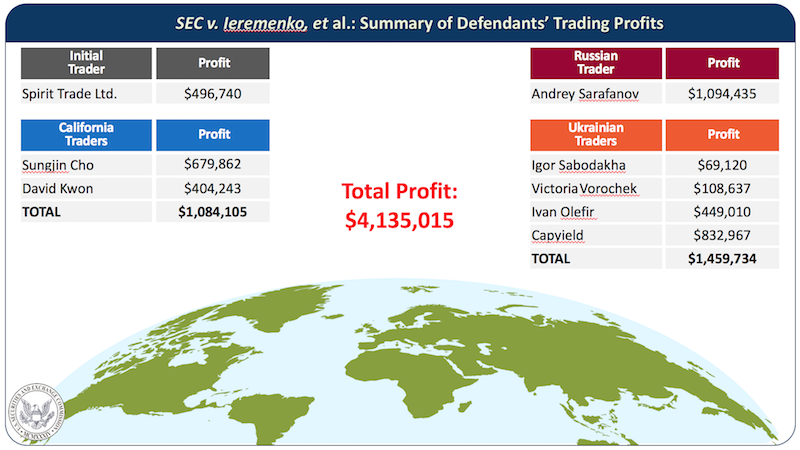 The SEC charged a Ukrainian hacker, six individual traders in California, Ukraine, and Russia, and two entities. The hacker and some of the traders were also involved in a similar scheme to hack into newswire services and trade on information that had not yet been released to the public. The SEC charged the hacker and other traders for that conduct in 2015 (see here, here and here). In a parallel action, the U.S. Attorney’s Office for the District of New Jersey today announced related criminal charges. The SEC’s complaint charges each of the defendants with violating the federal securities antifraud laws and related SEC antifraud rules and seeks a final judgment ordering the defendants to pay penalties, return their ill-gotten gains with prejudgment interest, and enjoining them from committing future violations of the antifraud laws. The SEC also named and is seeking relief from four relief defendants who profited from the scheme when defendants used the relief defendants’ brokerage accounts to place illicit trades. The SEC’s investigation, which is ongoing, was conducted by Market Abuse Unit and Cyber Unit staff David Bennett, Arsen Ablaev, Michael Baker, Jason Burt, Laura D’Allaird, Adam Gottlieb, James Scoggins, David Snyder, Jonathan Warner, Darren Boerner, and John Rymas, and IT Forensics staff Ken Zavos, Douglas Bond, Stephen Haupt, Gi Nguyen, and Jennifer Ross. The Division of Economic and Risk Analysis and the Office of Information Technology provided substantial assistance. The investigation was supervised by Robert Cohen, Joseph Sansone, and Carolyn Welshhans. Cheryl Crumpton and Stephan Schlegelmilch are leading the SEC’s litigation. The SEC appreciates the assistance of the U.S. Attorney’s Office for the District of New Jersey, the Federal Bureau of Investigation, and the U.S. Secret Service.